That’s about as far as I can take it. If you live anywhere that isn’t south Florida or San Diego, you have stared at the single-digit temps on your various weather apps/televisions and cried in despair, I know. I have too. Actually, it’s pretty ignorant and America-centric of me to only single out part of two warm states. Oceania and most of the Southern hemisphere, I am shaking my fist in envy at all of you, as well. Truthfully, my fist is shaking all on its own anyway, BECAUSE IT’S THREE DEGREES OUTSIDE. Also while we’re being honest, I’m usually jealously shaking my fists at Oceania anyway, because my lifelong dream has been to bum around New Zealand and pretend that I am a Hobbit, which wouldn’t be too difficult given my diminutive stature (yes, I said lifelong, because my life clearly began once I found a story involving other petite, introverted, curious creatures with a preference for brightly-colored clothing with whom to identify). One day, NZ. One fateful day. The scene outside my window today. 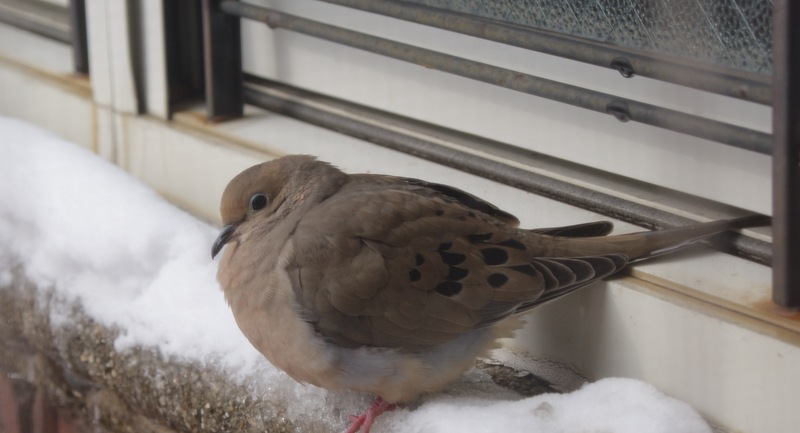 Poor little guy needs a space heater. Actually, can we talk more about Hobbits for a sec? Because my knowledge basically comes from all of the movies and now Wikipedia, which I am finding fascinating. If Wiki is to be believed, Hobbits “come of age” at 33, which means that it’s totally fine that I still feel completely and utterly lost in life. Perhaps in three and a half years’ time, I’ll find myself on an unexpected journey (*wink*) to self-actualization. Tee hee. Ok, I know what’s coming next so I’m going to try to head it off: guys please no more lectures on how nerdy this blog is getting. I already took a few jabs with the Star Wars references a couple posts back. I get it, I’m a hopeless geek. BUT I’M A GEEK WITH A TRIBE NOW. A fictitious tribe that now exists basically on the internet, in public libraries, and on DVD/Blu-ray, but still. Also my Gollum impression will bring you to tears [of pity or joy, it doesn’t really matter]. Ok, I’m really done now. I swear. 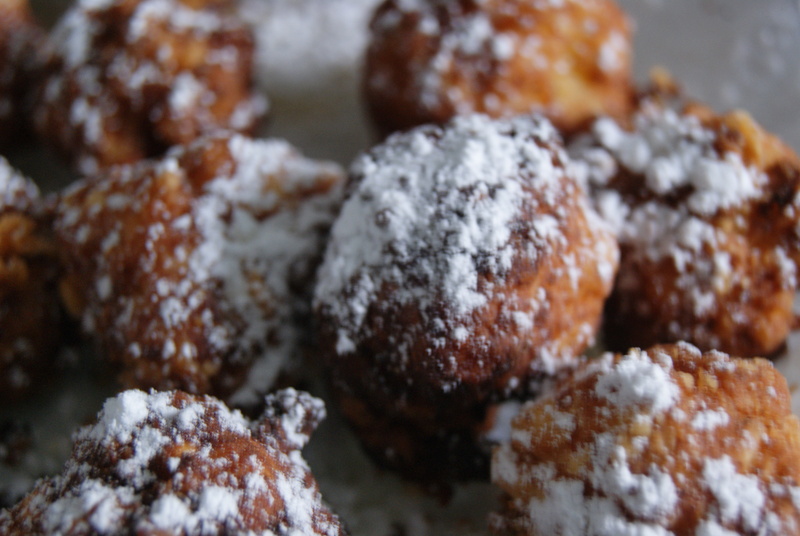 But speaking of things that are PRECIOUS, who likes fritters? I likes fritters. I likes them lots, but what I don’t like is third-degree burns from deep-frying stuff, so I’ve never attempted to fry anything before. 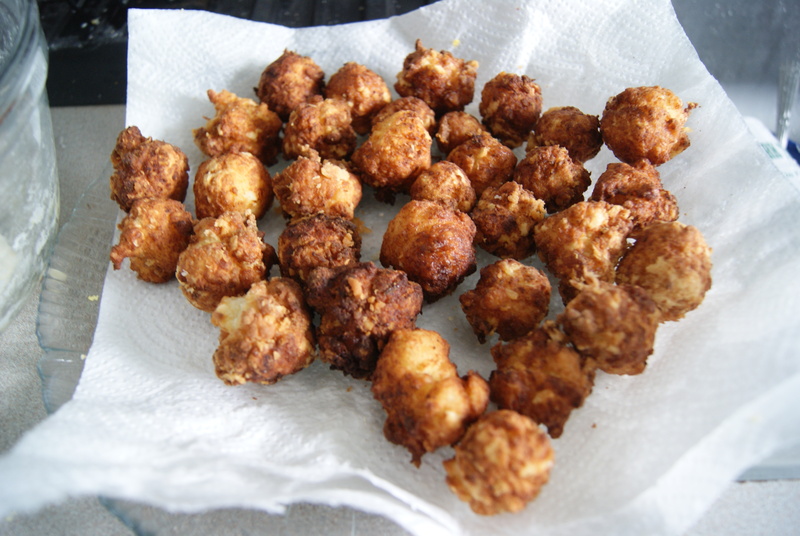 Since I’m trying to be more courageous these days, and also badly wanted fritters but was too lazy to step into the bitter cold for them, I decided that there was no better time than the present to try my hand at making some. Don’t be afraid, friends. Let’s do this. 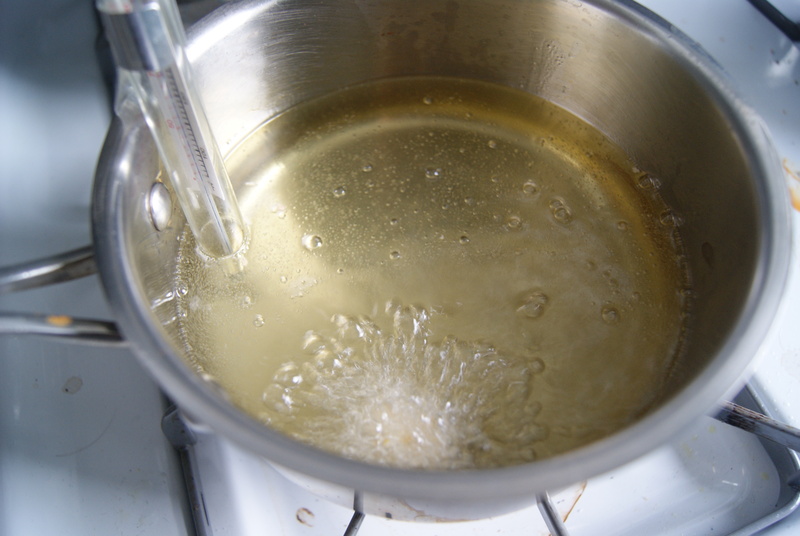 To start, in a large, wide saucepan with high sides, heat oil until a deep-fat thermometer inserted reads at 370ºF. Try to keep the oil at this temperature throughout the cooking process by adjusting the heat as needed. Uhhh… maybe don’t look directly into a boiling vat of oil. While the oil is heating, mix together flour, baking powder, salt and lemon zest. In a separate, larger bowl, stir together ricotta, lemon juice, eggs, sugar and vanilla, then add dry mixture to wet. You’re going to fry these in batches. To start, drop a tablespoon of batter into the oil and allow to fry until golden brown, about 2-3 minutes. 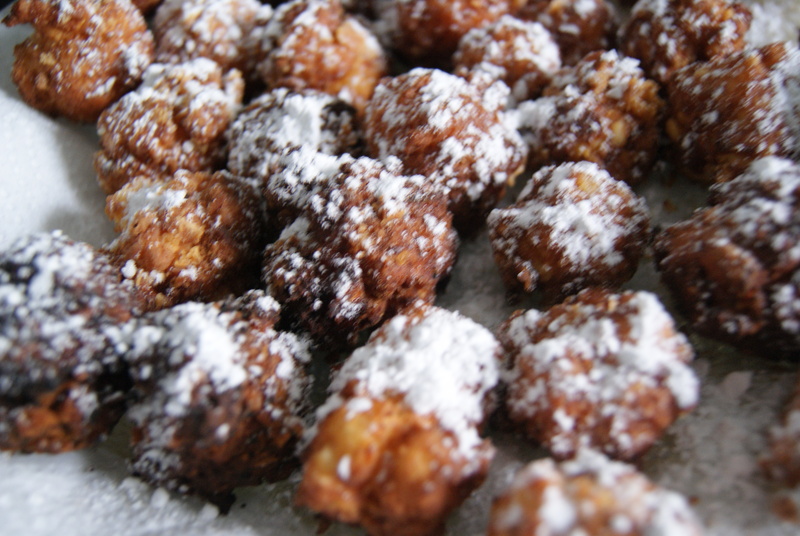 Remove with a slotted spoon, allow to cool, and taste-test the fritter to make sure it’s cooked to your liking. Then, begin dropping more spoonfuls of batter into the oil. You want to make sure there’s enough room for all of the fritters– I did about six spoonfuls per batch. Set fritters on a paper towel-lined plate to drain and cool. While still warm, if you’d like, you can drizzle these with maple syrup (just a thought, but I thought the maple hooked. these. up.). Once cooled, dust with confectioner’s sugar, and serve. They’re beautiful. Truly lovely, crunchy on the outside, creamy and lemony on the inside. Definitely best the day they’re made, these bite-sized fritters will not– did not, in our case– last long.